By John F. McKenna (McJack): Over the past couple of days two legendary fighters have come out publicly in support of pound for pound king Manny Pacquiao (53-3-3, 38 KO’s) in the ongoing dispute with Floyd Mayweather (41-0, 25 KO’s) regarding random drug testing as being the reason that the match up between the two has not taken place. On Tuesday boxing great “Marvelous” Marvin Hagler ripped Mayweather for not fighting Pacquiao and laid the blame for the fight not happening squarely at Floyd’s feet. Hagler was right on with his comments. He got to the heart of the matter and blasted “Money” for trying to dictate what Manny should do especially when his accusations are baseless. Hagler sees this fight as breaking all previous PPV records and restoring boxing to its glory days. Hagler maintains that the failed negotiations for the fight are a black eye for the sport. Unlike Floyd Jr. and his relatives Holyfield attributes Manny’s success to hard work and training and does not attribute it to PEDS as the Mayweather’s constantly do. Holyfield also praised Manny for being a great ambassador for the sport of boxing. 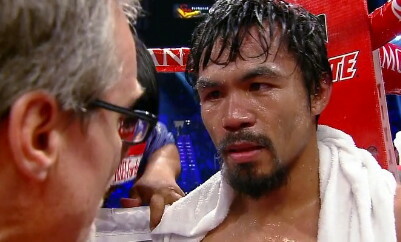 He also said that Pacquiao’s love for his fans is what separates him from everyone else. It is becoming increasing clear that Floyd Mayweather is further isolating himself for his refusal to face Manny Pacquiao in the ring. These latest criticisms of Floyd are not coming from his promoter, Bob Arum. They are coming from two of boxing’s greatest legends of the ring and thus carry greater weight.